Recently, I had an eye exam at Target Optical because my prescription for contact lenses had expired. When I was leaving, they asked me if I wanted to order contacts from them and I said nope...I already know how to save money on contact lenses. Or so I thought! This post may contain affiliate links, please see my disclosure policy for more information. I always bought my contacts online taking advantage of mail-in rebates and used Ebates to get cash back. (P.S. if you're not using Ebates for online purchases, you're missing out big time). Join Ebates for free today using this special link and you can get a $10 cash back bonus as soon as you make a qualifying purchase in 90 days. But it turns out that Target Optical is pretty impressive and by following the below steps I ended up saving around $200 on my contact lenses! I also included two more tips which my sister suggested after I told her about my success. I'm looking forward to using these next year. 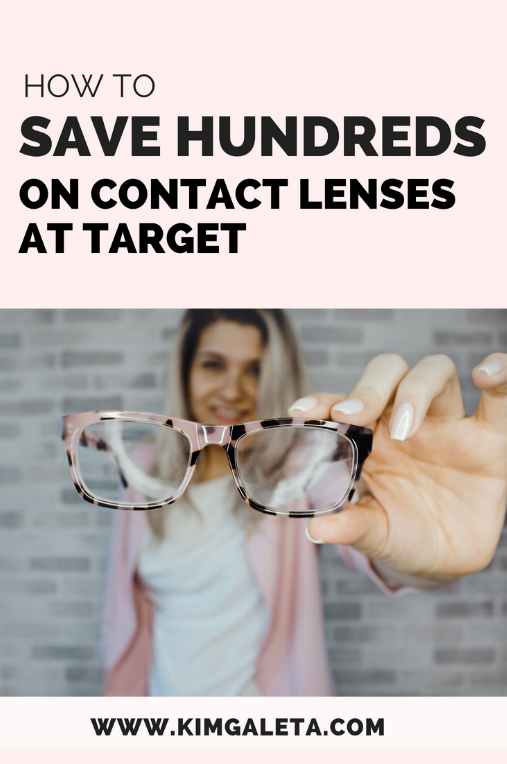 Keep reading to learn how to save money on contact lenses at Target. After Target Optical told me about some of their many ways to save I decided to go home and crunch some numbers before returning. I came back to the store with a print out of the most competitive rate online from 1-800-contacts which shaved a few dollars right off the bat. In reviewing things again though...they matched the price before the mail-in rebate which is something I need to double check for next time. I must say the service at Target Optical (at least the one near to my house) is superb. They were actively looking for ways to save me as much as possible...without me even asking! This really came in handy because I have honestly never really taken advantage of AAA discounts and don't have a card. However, the customer service rep suggested that I use my mom's! She texted me a picture of the card and that was acceptable! 1-800-contacts usually offers me an $80 mail-in rebate on an annual order. However, Target's is even bigger! A flexible spending account or FSA lets your employer deposit up to $2500 in pretax money that can be used for vision-related expenses (eye exams, glasses, contact lenses, etc). As you can see, all of these add up to significant savings! I was shocked when I got my receipt because I came in around $200 under budget after all the discounts were applied, woohoo! This was another great lesson in doing more research because we can always learn something new. I hope you enjoyed this post. If you did please share it in Facebook or any other preferred social media network. Also feel free to comment below if you have any other ideas on how to save money on contact lenses.